Waiting for Godot at the Barbican - the Quick and the Dead. A soft s-shaped brushstroke of light seemed to curve across the black space in front of us. This mysterious hieroglyph was revealed as a curving sculpture, representing an impossibly slim tree trunk that snaked up into the flies like an ossified liana. In the huge space, the tree was so improbably tall that no branches were visible, except for one, conveniently positioned for comically impractical discussions of suicide, and the "covering" of leaves after the interval. This painterly arboreal form seemed to be inside, or perhaps outside (it was hard tell) the empty cavern of an abandoned theatre building. In another inside-outside layer, the entropic environment depicted on the stage was framed behind an actual proscenium arch, thus in effect positioning this still life in another world for the audience. In contrast, Vladimir and Estragon sometimes came to sit companionably on the front edge of the stage, leaning through the fourth wall so that we spectators seemed to be part of the conversation. This intimate view of their relationship made me think of an old married couple, sometimes saying and doing mischievous things to each other under the stresses and strains of existence, but in fact deeply fond of each other. They know they depend on their combined chemistry (embodied by Hugo Weaving and Richard Roxburgh in a nicely-balanced mix of acrobatic slapstick and comic banter) to get through hell on earth. For me, the play Waiting for Godot is an outstanding piece of eco-theatre, defined as theatre in which an awareness of the ecosystem we are part of is embedded. Productions often appear after natural disasters, suggesting that others construct their own version of the ecological threads of meaning embedded in Beckett's text. In this production these threads do not initially come to the fore. On the contrary there is a separation between the naturalistic behaviour of the human beings and the mostly schematic presence of their environment. I say "mostly", and not entirely, because of the odd moments when the natural environment makes its physical presence felt, consumed as food, used in materials or dribbled (agonisingly by Vladimir and copiously by Luke Mullins' Lucky) in human excretions and secretions. The question is what does this mean, ecologically speaking, for spectators? Does this proscenium arch set-up reinforce the discourse of separation between humans and the natural environment inherent in the semiotically distinct strategies applied to each in this production? If it could be transplanted lock stock and barrel to an overtly eco-aware venue, would this set, even though it is constructed to look like a painting, come across as shape-shifter rather than mere scenery? Alternatively, do spectators (anyway) discursively resist any such dichotomy, and recognise the environmental shape-shifter at work? An answer may be provided by Didi and Gogo, who repeatedly talk about leaving each other but in reality know they are so fused with each other they cannot separate. So it is with humans and nature, no matter how impressionistically sketched the tree of life may be. Review by Julie Hudson. Performance seen on June 8th 2015. See also Godot at the Arcola, 2014. 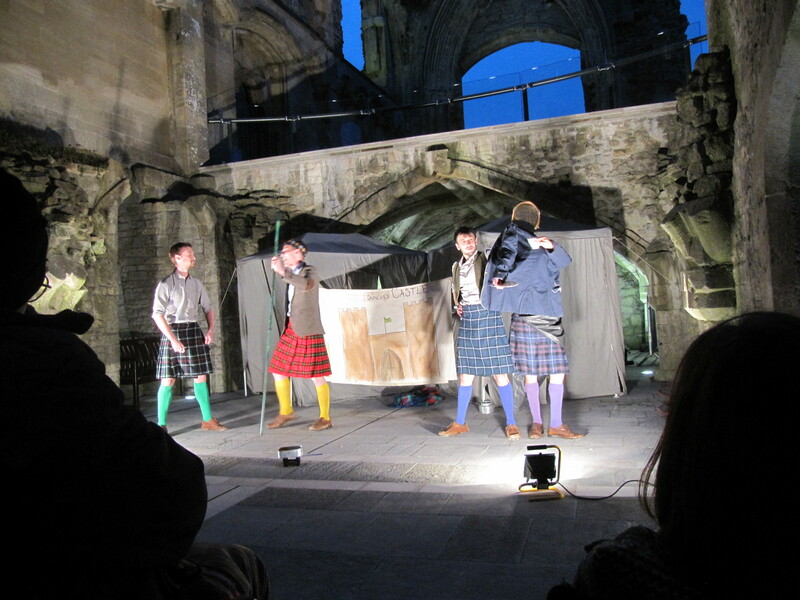 The Scottish Play in Glastonbury Abbey. HandleBardian Eco-theatre. HandleBards' thespian peloton - Calum, Tom, Callum and Paul - were clad in kilts and a fetching array of yellow, green, blue and violet knee-socks (for some reason they skipped red, orange and indigo but perhaps these are in the wash). 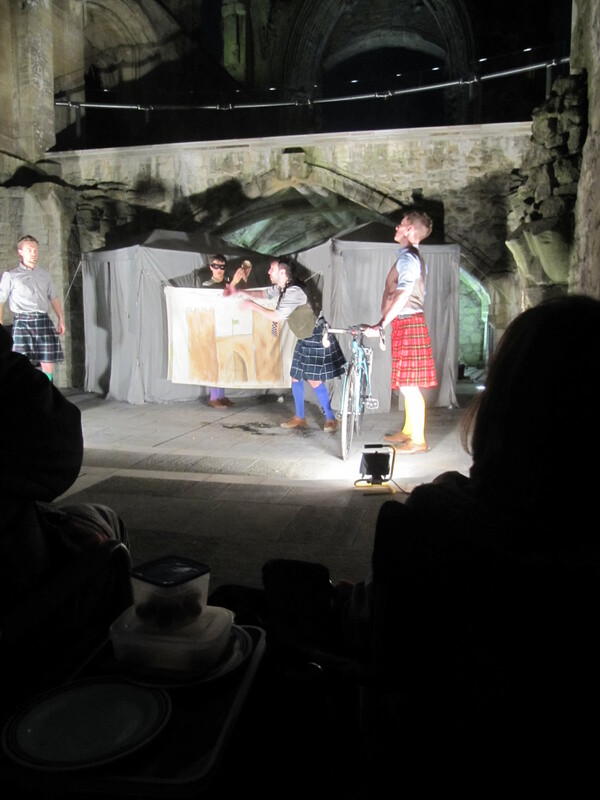 The socks, and come to that, the bloody baked beans, the three witches' unlikely garb (recycled bike parts and camping gear of course), and the weaponry (bike pumps at dawn), were all part of a consistent (and intelligent) comic take on the Scottish play. The HandleBards were funny, yet never lost the awful serial-killer plot that lies at the core. As members of the audience said on survey forms handed out at the interval: "Humour, yet true to the play, excellent delivery"; "Great fun yet true to the text"; and "Very fast-paced, ingenious, amusing, well-acted and invigorating." To borrow a line from another play, "The play's the thing." Playing with the play and playing the play, the HandleBards' stock in trade is tension between horror and comedy. Take the way the cast handled a small mishap in I. iv. (This is the Scottish Play after all.) Macbeth, Duncan, Banquo and Malcolm are pictured just before Malcolm's teacup came unstuck from the saucer and fell noisily to the stone floor. The tennis-racket-headed Handlebard (who had to play Malcolm because Banquo was also on stage) leaned exaggeratedly over to pick it up, supported by the blazer sleeve (which did not tear) and Banquo. Banquo was absolutely unmoved by Malcolm's antics. He played his part as if nothing other than Malcolm's investment as Prince of Cumberland (and MacBeth contemplating murder) was going on. So it went on. Macbeth is several times described as 'rapt' - more than once, an arm was waved in front of his eyes to wake him up. The dagger Macbeth saw before him was a camping spoon dangling ridiculously on a fishing line, and Banquo's ghost a two-eyed piece of gauze whisking around (in between the bats) on the same fishing hook. But, enough about the props. What about the acting? The HandleBards' Macbeth is so full of hubris he looks as if he might occasionally explode like an over inflated inner-tube. Think about this image for a second and it's hilariously funny. Think about 100 pounds of pressure per square inch held in by a thin rubber wall and it's not. It's deadly, and fragile. Bent on murder, he crept around the castle a la Inspector Clouseau, glittering blue eyes narrowed, knees bent, camping cutlery at the ready. Once double murder had been done (I will never be able to look a baked bean in the face again) and the Macbeths were at dinner, Macbeth did a brilliant job of being absolutely petrified of Banquo's Ghost, and we extras - audience temporarily playing dinner guests - felt suitably embarrassed by his very odd behaviour. But, we resisted Lady Macbeth, stood upon our going and did not go at once because we were absolutely hooked. One of the hooks, without question, was the breathless switching of roles as fast as a bike going downhill with no brakes on. Another was the attention to detail. Small roles stood out - such as the drunken Porter memorably telling the farmer-equivocator joke in the 'Knock, knock, knock' scene just before all hell breaks loose. Small moments stood out too - such as MacDuff's arrival by bicycle-horse, which clip-clopped around the stage until threateningly shooed out by MacBeth: 'This is the door.' Elsewhere, the battle between MacDuff and Macbeth occasionally went into slow motion so we could appreciate the comic-strip distortion of MacDuff's face wrought by the heavy blows delivered by his adversary. Throughout, role-switching also added to the dramatic tension - most notably, the gulf between the simple, soft Rosse and the astute, manipulative, murderous Lady Macbeth could hardly be wider - so, the impact of each role seemed to me to be enhanced by the other because the contrast was reinforced by the 'doubling'. The Scottish Play is a frugal play. A member of the audience, asked whether they thought this production could be called eco-theatre, responded by saying that, well, yes, it could, and actually it has often been performed when acting companies are going through hard times. When you've only got four actors and you need at least seven of you on stage, what do you do? If you are the HandleBards you judiciously merge the odd role; you find an old tennis racket and dress it up in a tie, hat and jacket, and you recycle any pieces of clothing not being worn by the cast to stand in for them - as pictured here. You can also borrow members of the audience, putting hats on them or even giving them a short script - in a nice touch extra witches in Act IV, described as 'spurious' by one Arden Shakespeare editor, were played by members of the audience. This review would be incomplete without a mention of the performance site. Glastonbury Abbey. Ruined castle walls without lifting a finger. 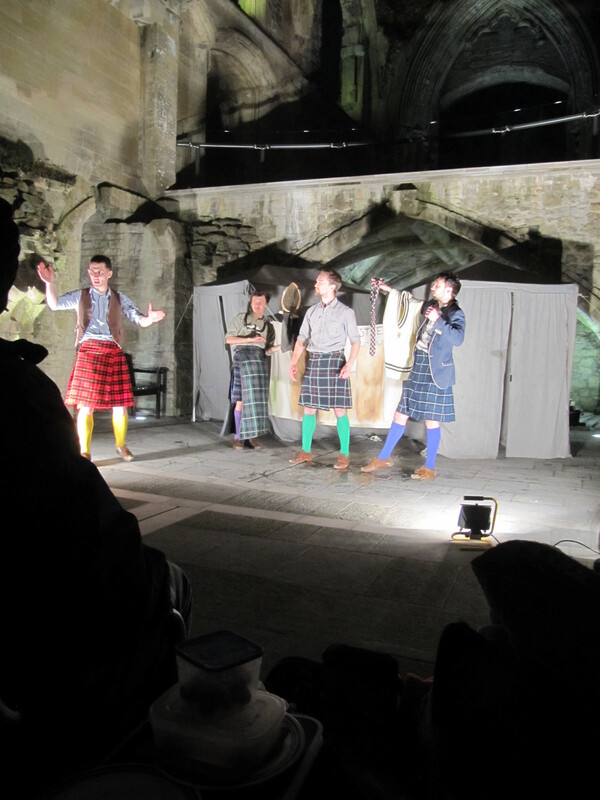 There could hardly be a more atmospheric place for a production of the Scottish play. The fifty-strong audience arrived mostly well equipped (thermals, hats, gloves, food, wine, hot tea) for the bracing March evening. Thus insulated, we were in tune with the gargantuan eco-theatrical task this acting company has set itself, impressively delivering high energy performances after cycling between venues with set, props and sound effects in tow; even if we didn't cycle all the way to Glastonbury Abbey from Stratford upon Avon to see it. Reviewed by: Julie Hudson. Performance Date: 27th March 2015. A Chaste Maid in Cheapside. Dearth Play in Disguise. Reviewed by: Julie Hudson. Performance Date: 10th March 2015. Source: International Beckett Season Programme 2-21 June 2015. Paul: Lady MacBeth, Rosse, Fleance, Boy. Fig. 2: 'This is the door'.